I recently posted this, but I don’t think anyone listened to the interview because the link I posted was bad and no one told me about it… I just finished this up and it is excellent. Personally, I don’t have one Muslim friend. I have never shared the gospel with one. This message is convicting and timely. Please take the time to listen to it, get the books I have linked, and volunteer to help an immigrant Muslim. A place to start looking for volunteering opportunities? Mark Dever recently interviewed former member of Capital Hill Baptist, Thabiti Anyabwile. I haven’t listened to this yet, but I know this is going to be good. 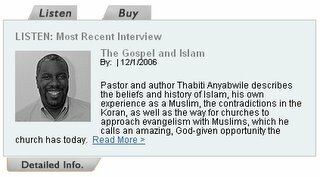 Thabiti Anyabwile is one of my favorite bloggers and a converted Muslim (and incidentally Challies King for a Week – I’m calling that a personal victory). His series is completed on Witnessing to Muslims. This would be a good one to print and keep. 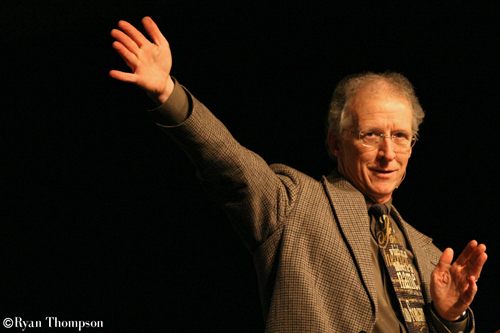 Perhaps the greatest challenge to effective gospel outreach to Muslim friends and neighbors is fear. It’s sometimes a subtle fear that appears in our assumptions (“they won’t be interested” or “it’s useless trying to reach out”) and sometimes appears in more visceral ways. But fear pervades our interactions with men and women who practice Islam. But God did not give us a spirit of fear or timidity but of power, of love, and of self-discipline (2 Tim. 1:7). This truth needs desperately to be remembered when evangelism and Muslim are used in the same breath. There are four fears that most Christians tend to experience when it comes to sharing the Gospel with Muslims. 1. Fear of Terrorists: Let’s face it; a great number of us think “terrorist” or “potential terrorist” when we see an Arab, in general, and an Arab Muslim in particular. The images that inform this fear are plentiful: images of 9/11, of bearded men with head scarves, of angry Arabs protesting cartoons, of masked militia wielding automatic weapons and rocket launchers, of young Arab boys throwing Molotov cocktails and rocks at tanks, of dreaded suicide bombers maiming and killing bystanders and civilians. The almost daily deluge of these images fills us with suspicion and fear and causes us to hesitate in sharing, lest we talk with an actual terrorist and somehow end up on their “hit list.” This fear blinds us to the person’s great need of a Savior by focusing us on ourselves, our vain lust for security and safety. So, what if the person is a terrorist? Aren’t we better of rejoicing at the prospect of speaking with a terrorist and by God’s omnipotent aid actually seeing them converted from such hate-filled darkness to the joy and love-filled light of Christ? The Christian’s “war against terror” is the warfare we wage to spread the gospel to all—including folks we fear might be terrorists. Thabiti Anyabwile at Pure Church has an Update on A Pastor’s Evangelism. I’ve appreciated his encouragement for further growth in my life in this area. I hope you feel the same way. 1. In the last week and a half I’ve had extended conversations about the gospel with three different persons. Two of those persons have agreed to meet with me regularly to continue our discussions and to think about how the gospel applies to some issues they’re facing. 2. I’ve been able to complete about 5 or 6 “reverse membership interviews” since settling into the office. And I’ve been greatly encouraged to do the work of an evangelist as I’ve heard the wonderful and diverse ways the Lord has worked to bring people to Himself. 3. Thanks to my most able and gracious helpmeet, we now have a dinner appointment with the neighbor for next weekend. Should be an interesting conversation. She seems to be a kind lady–describes herself as Catholic but “likes to bounce around to different churches” (including FBC). Looking forward to the time together. Thanks Kristie! 4. I’ve found two very competent barbers. Only one professes to not be a Christian. He’s also one of the persons with whom I’ve had good evangelistic conversation. Praying the Lord gives us a continuing relationship and the fruit of conversion. 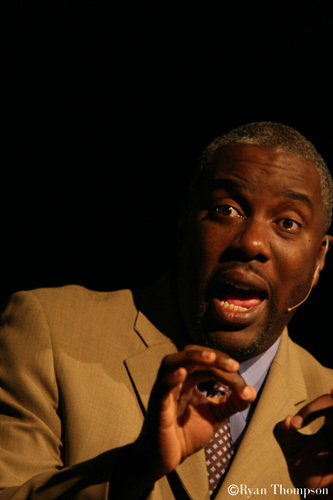 Read on for how you can continue to pray for Thabiti. Thabiti Anyabwile is quickly becoming one of my favorite bloggers. His series is completed on Witnessing to Muslims. This would be a good one to print and keep.